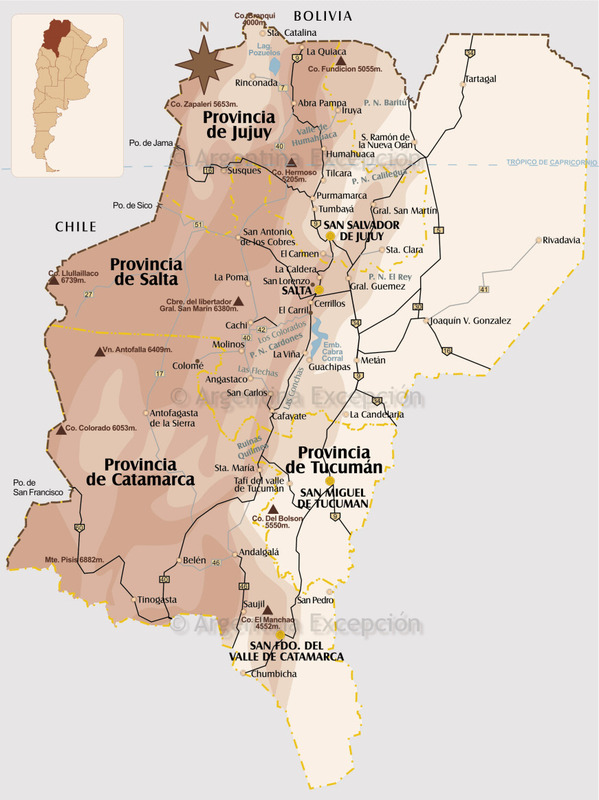 Information about Cafayate and the Calchaqui Valleys in Northwest Argentina, by our local travel agency from Buenos Aires. The Calchaquí Valleys are undoubtedly one of the most beautiful natural sites in Argentina. 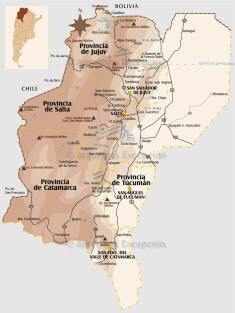 A landscape of mountains and valleys spreading out over 520km in the provinces of Catamarca, Tucumán, and Salta. 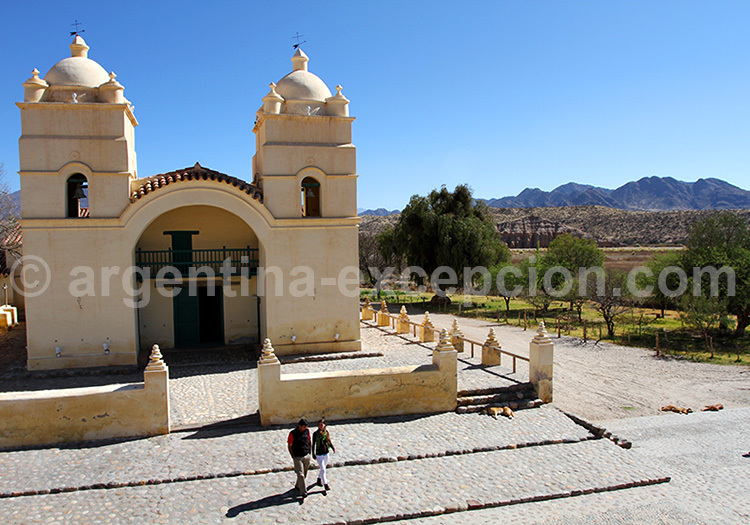 The most popular city around Salta is Cafayate, down the mythical Route 40 and the Calchaquí River. A narrow, mostly unpaved, road crossing through Cachi, Molinos, Angastaco, located at the core of a breathtaking setting of red-colored mountains carved by nature through the centuries. Summer time (December to March) is the rainy season, and precautions should be taken when driving at this time of year. The best option is to check the road conditions in the morning, explore the region during the morning and late evening hours, and nap during the hottest hours of the day, following local traditions. The Calchaquí Valleys were named after the Calchaquí or Diaguita indigenous people, fierce warriors who confronted the Spanish conquistadors with bows, arrows and axes for an entire century. In 1561, the Diaguitas sought refuge in the Valleys where they prepared to fight against the Spanish commanded by the cacique Kalchakí. This is the reason why they were called Calchaquíes. Finally defeated in 1667, many of them were deported to other regions like the Quilmes, who were taken to the province of Buenos Aires against their will to an area that currently bears their name. With its dry and cold climate, the puna does not have so much biodiversity as the yunga. It is posible to see an Andean condor or some pink flamingos. The lamas, vicuñas and alpacas are prensent all over the place. 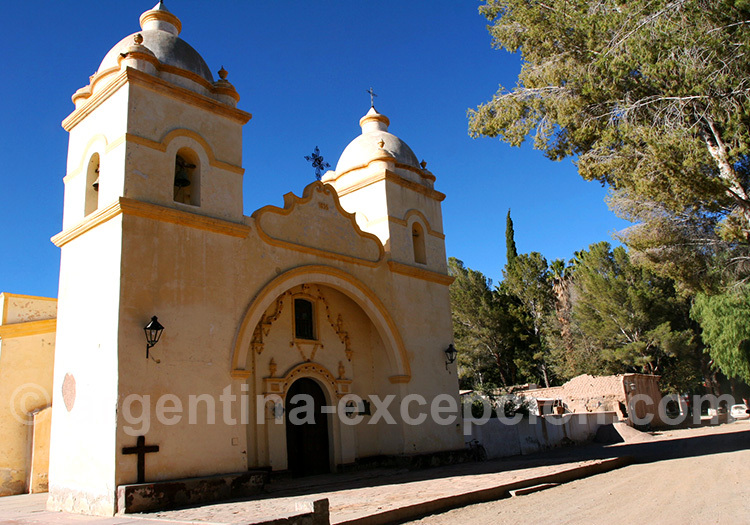 Cafayate is famous for being the birthplace of folklore. 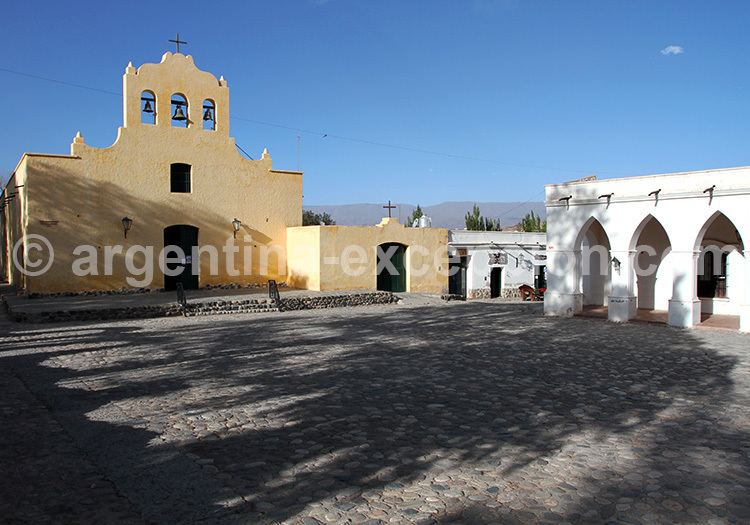 Since 1974, the Serenata en Cafayate festival has been held there, hosting the best musical artists in the country. All throughout the northwestern region people enjoy meeting with friends and family while eating, singing and dancing. Often, restaurants and bars have artists playing live, and sometimes the owner of the establishment will even play the guitar for its guests. 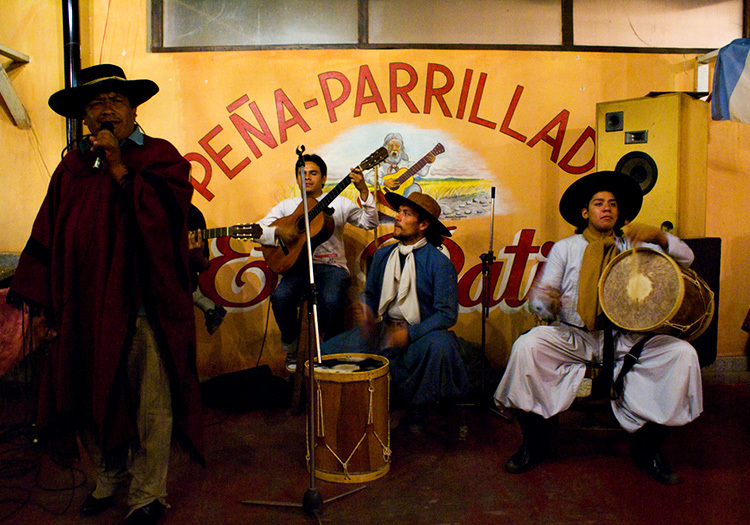 Serenata en Cafayate is a way of playing tribute to northern people through their love of music. All kinds of popular music are represented, both younger talents and the most famous ones, namely: Los Nocheros, Los Huayras, the Chaqueño Palavecino. Amblayo is located at 2290 meters above sea level. 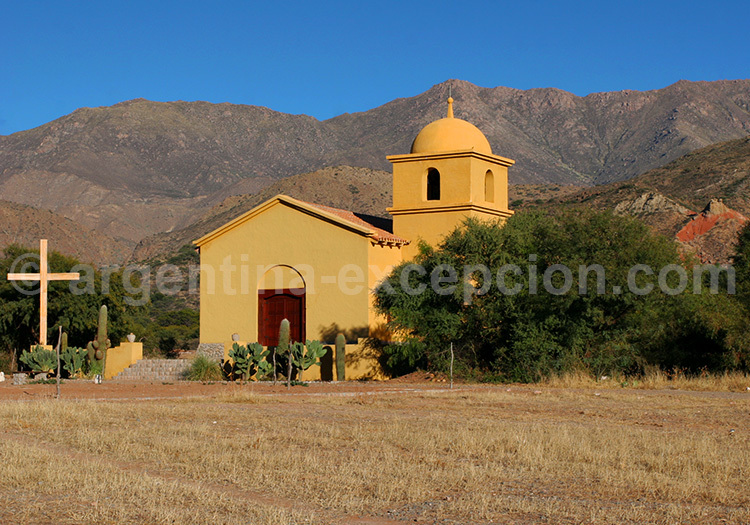 It is in the middle of the agricultural region which lays from Calchaqui valleys to Lerma valley near Salta. Very isolated, it is accessible via a 45 km long path, sometimes cut off by the rain. A good place to enjoy the landscape riding a horse. Payogasta means white village in Calchaquí language, because of the snow on the top of the surrounding mountains. It is located on the road 40, at 10 km in the north of Cachi. The local specialities are cheese, goat milk, mais and quinoa. 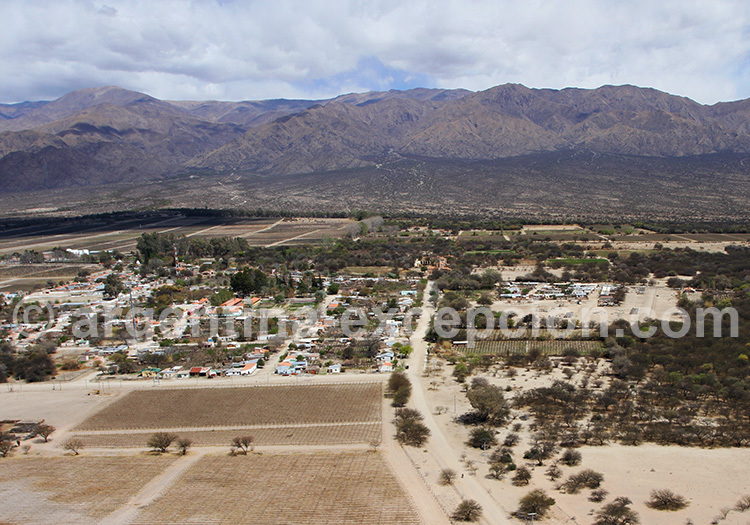 At 2,200 meters above sea level lies the town of Cachi. You’ll be tempted to rest there and enjoy the captivating serenity of the place and the surrounding magnificent landscape. Cobble-stoned streets, small white houses, a beautiful cactus roof-top church, a small archeological museum devoted to the Calchaquíes, and a handicrafts market. Moreover, there is an old mill that has been turned into a hotel, El Molino de Cachi Winery. With its houses on each side of the road, Seclantas is a traditional village of 300 habitants. It was registered as an historical place in 1975, to valorize its traditional architecture in mud and straw, and its colonial church, la Iglesia del Carmen. 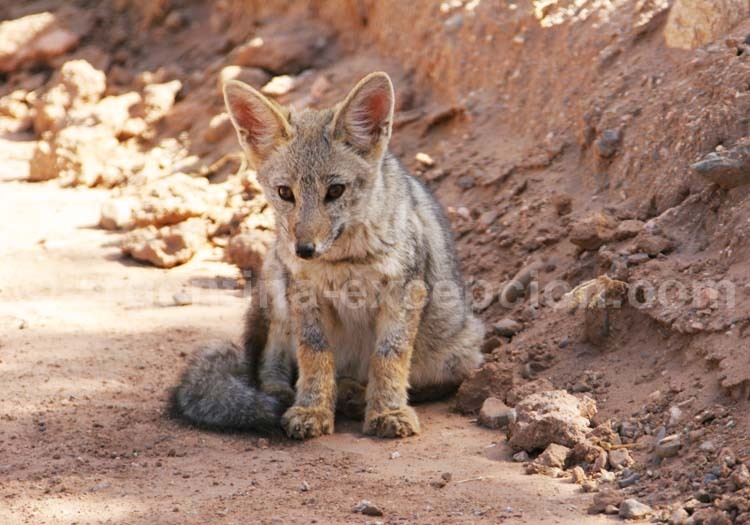 A thrilling dusty portion of the famous Route 40, joins Cachi to tiny towns up to Molinos. It is one of the nicest trails of the Calchaquí Valleys. Though all this land looks deserted and forgotten, the place has been a key commercial artery all the way down the Andes Mountain Range Route. The town’s name derives from the many mills located along the river. Deviating just 40km from this place, the Colomé Bodega welcomes guests to experience the beautiful surroundings while staying right in the heart of the vineyard. Located at 2.200 et 2.300 m above the level of the sea, it is famous to be the highest winery in the world. 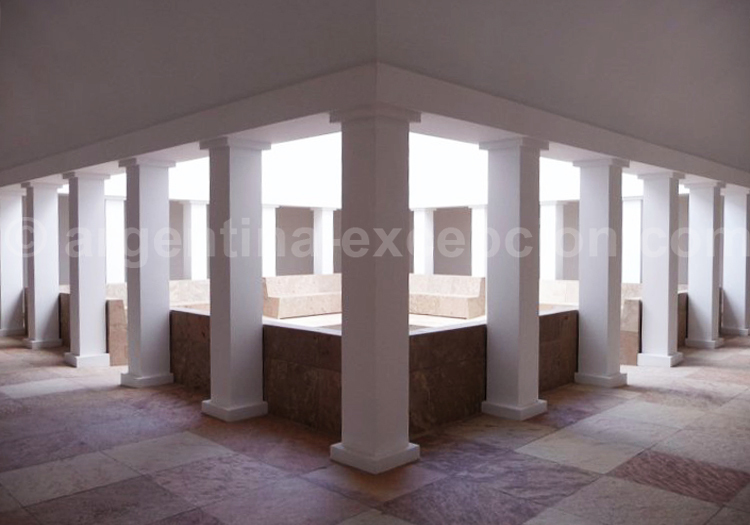 A high level museum showing contemporary art on 1.700 m2 is open to visits at the estancia Colomé. It presents the works of art with lights and walls designed by the american artist James Turrell. The other big moment of the visit is the winetasting of high quality wines, regularly rewarded by Wine Spectator. The route extends further to Angastaco: a place full of pepper fields and a small town center that comes alive only after the locals have rested during the hot hours. 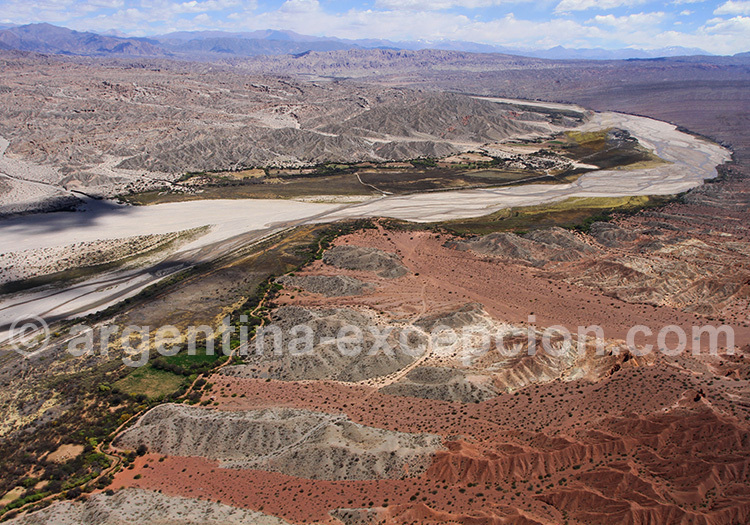 A few kilometers away from town lies Los Colorados: a huge natural amphitheater enclosed by red mountains. San Carlos has a nice colonial church built in 1801. Its museum, opened in 2008, shows pre-Colombian culture and the heritage of Calchaquíes Community since the XIth century. In Cafayate, people congragate at Plaza 20 de Febrero, the town center, around which there are bars, restaurants, and stores. 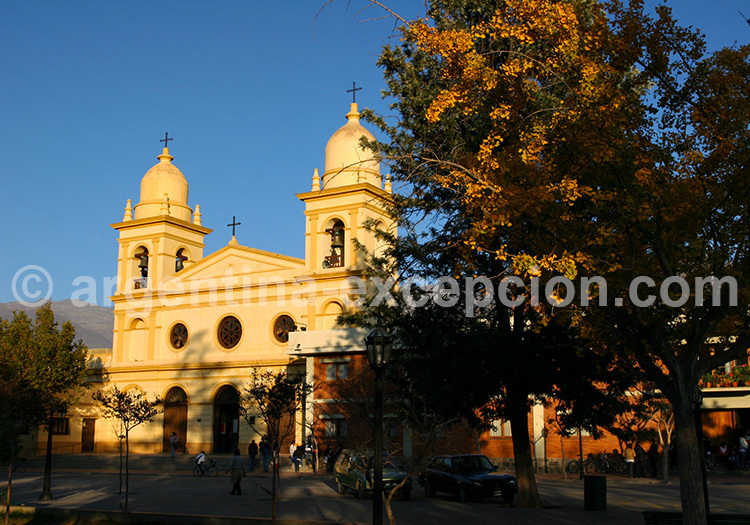 Nuestra Señora del Rosario Cathedral, built at the end of the 19th Century, is one of the few churches to have five naves. There is also a handicrafts market offering typical regional products such as: knitted, leather and wood products, pottery and baskets. An interesting outing is a visit to the Rodolfo I Bravo archeology and history museum exhibiting beautiful objects that belonged to the natives. Whether in the city or in its surroundings, there are plenty of wineries to be visited: Etchart, Félix Lavaque, Nanni, Torino, etc. This is a good opportunity to taste the torrontés, a white grape variety of intense scent, with hints of tropical fruit and white flowers. For those interested in wine history, we suggest a visit to the Grapevine and Wine museum (Museo de la vid y el vino), which has been open to the public since 1981. 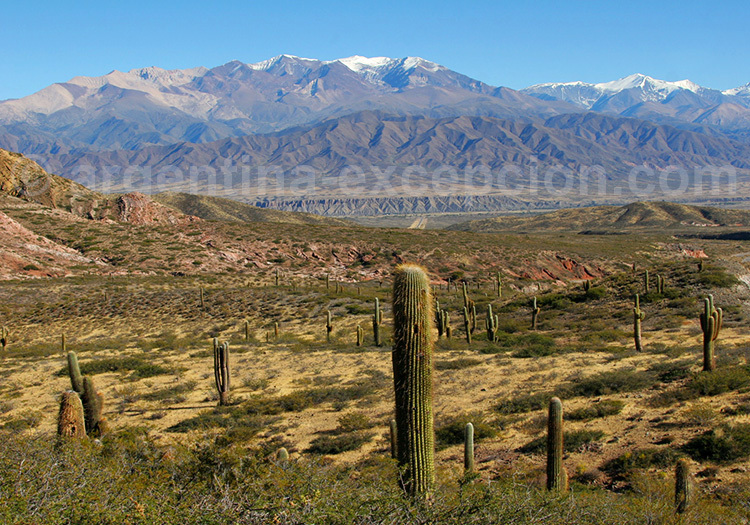 Some kilometers away from Cafayate, down the main road leading to Salta, visitors will be amazed by the spectacular scenery stretching over 50 kilometers: the Quebrada de las Conchas. A long canyon furrowed over time with geological layers sculpted and resulting in curious mountain formations such as: the Castles, the Obelisk, the Monk, the Frog, the Amphitheater, the Devil’s Throat. The road joining Salta and Cachi will evoke nothing but delightful memories and profound excitement: the first challenge is the Cuesta del Obispo, a zigzagging slope across the forests up to 3,000 meters above sea level. Then, the setting completely changes to a plain and arid terrain, watched over by the cacti of Los Cardones National Park. Take care at the Tin Tin Straightline: signs warn you not to speed up on this final straight since llamas tend to roam freely (and may randomly cross the road!). Setting off from Cachi, the popular Route 40 stretches out along the Calchaquí River to the south. The route extends further to Molinos and Angastaco. Route 40 crosses the dunes towards the Quebrada de las Flechas, a canyon fenced by red arrow-shaped mountains pointing up to the sky. Stunning! 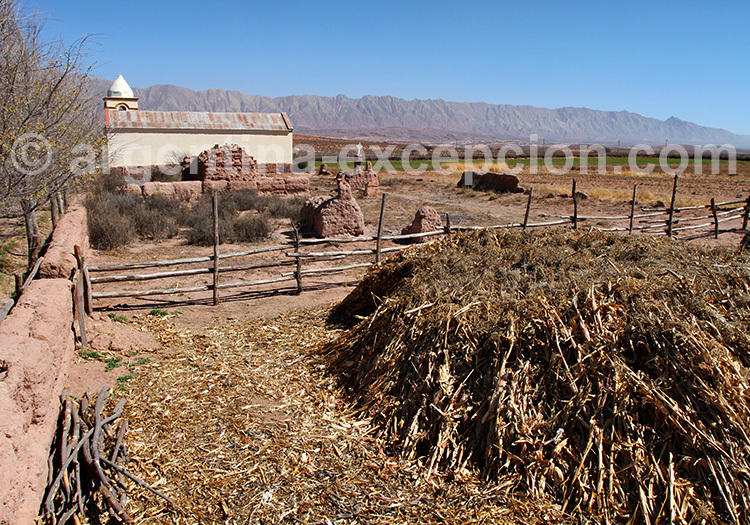 Then, near Cafayate, green cultivated fields confirm the presence of men in this secluded paradise. The first vineyards introduce a thriving little town whose main industry is wine. Hotels : where to stay in the Calchaqui Valleys ? Hacienda Los Molinos : wonderful, recently restored, colonial estancia in the heart of the village of Molinos. Patios de Cafayate Hotel: a lovely place to treat yourself to a wine spa offering. 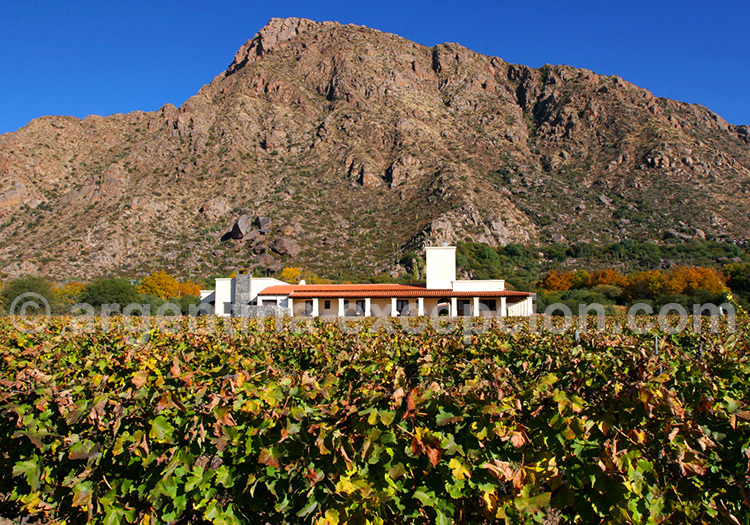 Cafayate Wine Resort Hotel: a ranch for a pleasant stay right in the heart of the vineyard. Restaurants : where to eat in the Calchaqui Valleys ? Rincon Florido in Angastaco : a nice culinary stop to taste regional specialities, like empanadas and goat stew, grill or casserole with torrontés wine. Finca El Carmen on Angastaco road : big old house with a nice library and tasty traditional meals. Macacha in Cafayate: a sophisticated restaurant where you can choose from a wide selection of wines, especially those from the Calchaquí Valleys. It offers high-quality tradition-inspired dishes. A perfect place to learn about northwestern gastronomy. Comedor Criollo in Cafayate: it serves typical Argentine barbecue (asado) and wine, especially torrontés, Cafayate’s most produced variety. Shopping : what to buy in the Calchaqui Valleys ? 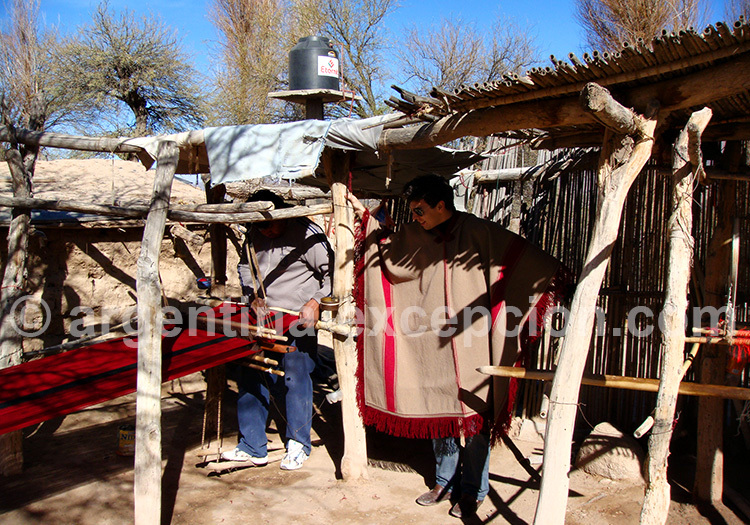 Handicrafts: Cafayate’s stores and craft markets have plenty of great souvenir options: pottery, baskets, knitted products, and ponchos made of llama wool. Wine: not-to-be-missed torrontés, a variety of white grape and the speciality of Cafayate region, in the highest bodegas of the world. Ponchos: famous in the region. It is nice to visit the family who make it in their houses, especially along the 10 km of eastern bank of the Rio Calchaquies, between the road 42 and the village of Seclantas. Transport : how to get to the Calchaqui Valleys ? 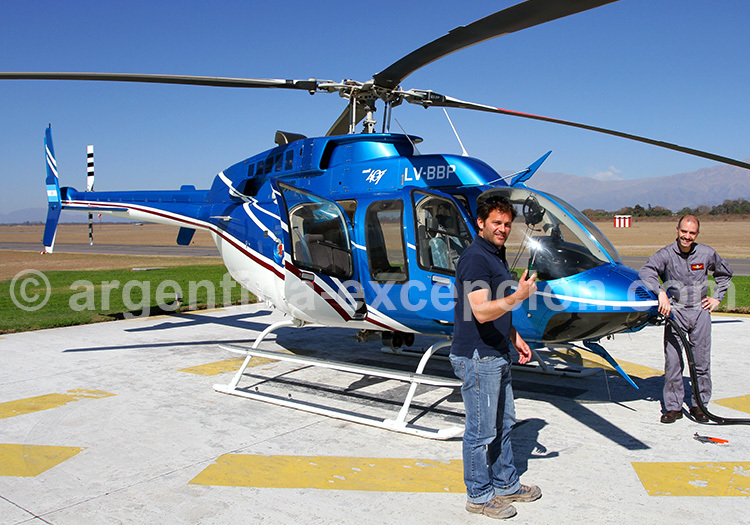 From Buenos Aires, the best way to get to the Calchaquí Valleys and Cafayate is to fly straight to Salta, and then rent a car. 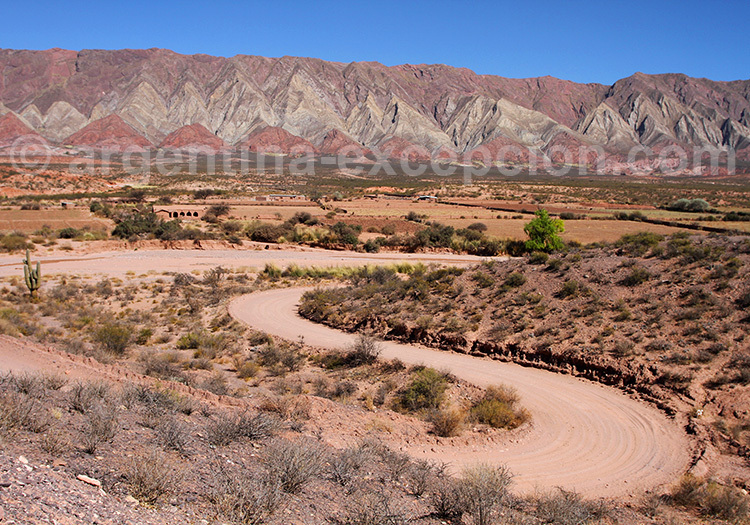 If you choose to travel by bus, the trip from Buenos Aires to Salta will take around 20 hours. Air: Fights coming from Buenos Aires, Tucumán and Córdoba arrive at the General Güemes Airport, located 10km southeast of Salta. Carriers: Aerolíneas Argentinas, Aerosur, Andes, and LAN. 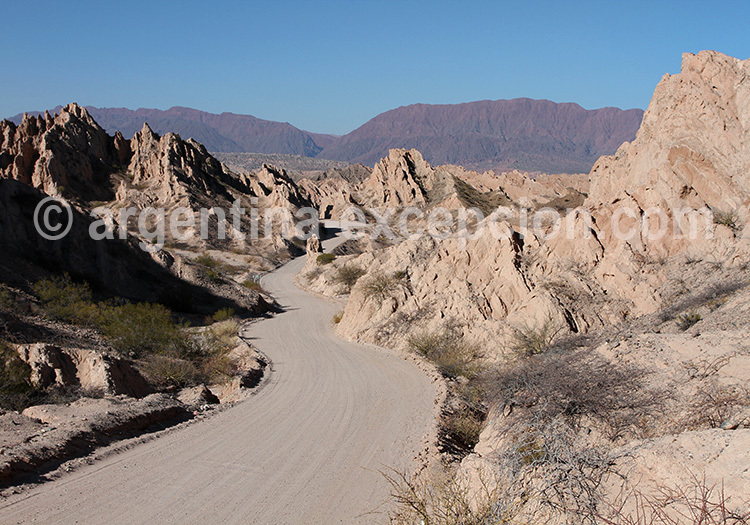 Road: Cafayate is located 235km north of Tucumán and 180km south of Salta, down National Route 68 or Route 40. 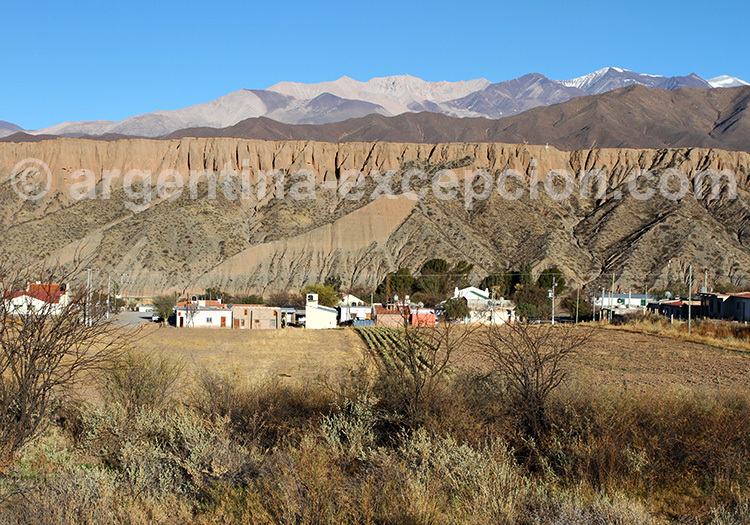 The ride down Route 40 to Cafayate takes long hours, so it is good advice to depart early in the morning. A rest stop is quite recommended. Fly and drive Salta, Calchaquies Valley, Cafayate, Quebrada de Humahuaca : 12 days around the most beautiful sites of Salta region. Category of accommodation: charm. 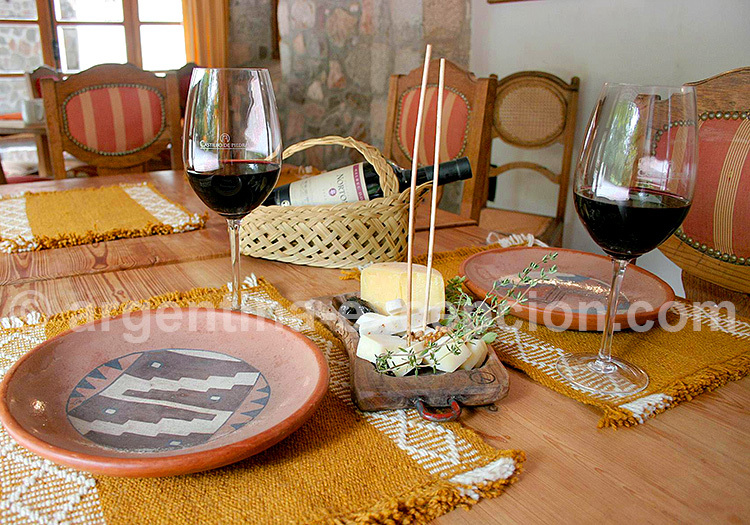 Salta and Mendoza wines and gastronomy : tour the best Argentinaen wineries with stops in exceptional estancias in Salta, Colomé and Cafayate.